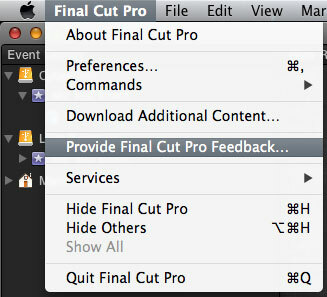 A lot has been written on the subject of how to share Final Cut Pro X (FCP X) projects. Some say it can’t be done. Others say it can be done, just with caveats. I’m here to tell you that after much experimentation, I have figured out how to make FCP X do pretty near precisely what FCP 7 does for media management. Shoot the series in Georgia. While there, load the footage to Ruth’s computer. I travel back to my home state, Illinois, with a copy of the project and media on my external drive. Ruth and I share project files back and forth as we cut episodes and review each other’s work, making changes on either end. Ruth and I are very collaborative editors. We often make changes to each other’s edits, and we tend to divide work according to individual strengths when it comes to creating additional media such as titles, visual effects, and so forth. This posed a problem where FCP X was concerned. I had been led to believe from the sharing tutorials I’d found that it was impossible to add media to a shared project after initially copying the event. I didn’t want to deal with making a new event to send every time I added another file to the project, but that seemed to be the only option. But it’s not! I recently spent a few hours extensively testing how FCP X handles sharing, simulating two different computers with a couple of external hard drives that I could completely unmount. Here’s what I found out. Once you’ve shared the project file with another person, something happens that’s not covered in that helpful episode of MacBreak Studio. When you launch the project, you may end up with a media offline error, even if you have all the files in the same event. Don’t worry; it’s okay. Go to the Project Browser and right-click on your shared project. 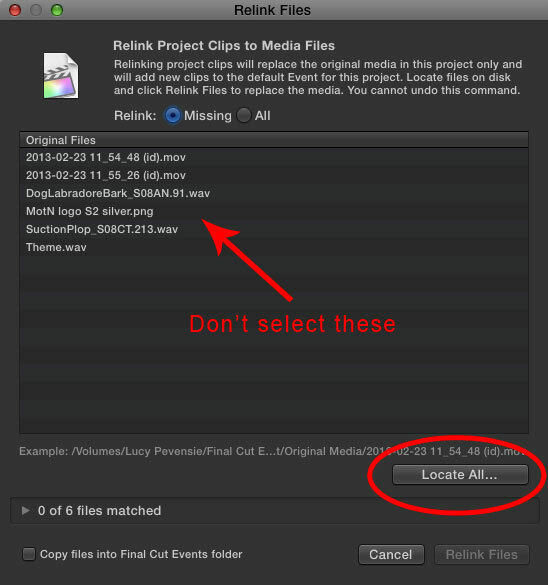 Choose “Relink Project Files…” and step through the process. Don’t pick just one file; that’s the slow way. 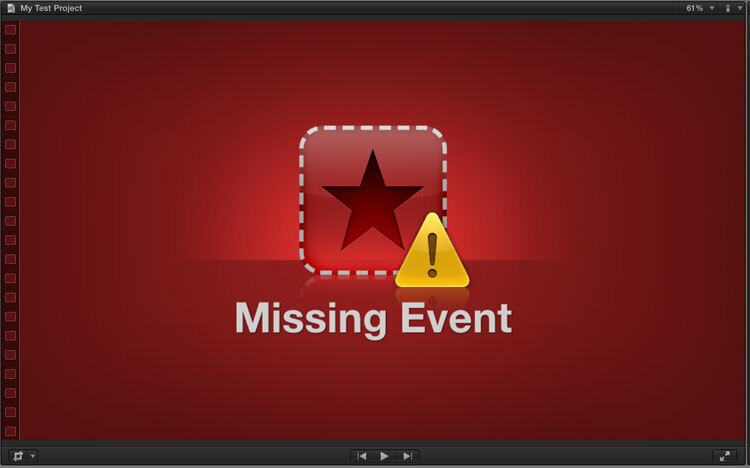 Hit the “Locate All…” button and navigate to the event on your drive. Pick the file FCP X is asking for and reconnect it. It’ll pick up everything else in the same file path. Let’s say I want to add a new clip to my project. I’ve put together a new opening title graphic in Photoshop that I’m going to us. I import it into my project and it goes into the default event. I’ve chosen to create a new folder of additional media files for this project, where I’ll store all the new stuff either editor creates so I can keep track of it. When I bring in the files, I make sure FCP X isn’t going to copy the files into the event folder. Instead, it creates symbolic links to the original files in my other folder. Now I can just add the new file to the timeline, then give the new version of the project (CurrentVersion.fcpproject) to the other person. Of course, I’ll also give them the new opening title file so they can import it in the next step. Just like before when we reconnected the media, we’re going to go to the Project Browser and bring up the Relink Project Files window. 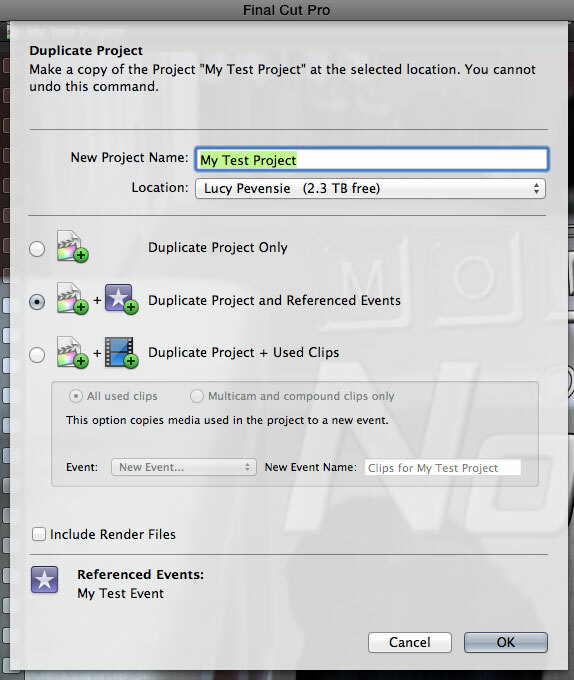 Select the new files from the folder (once again, tell FCP X not to copy the files to the event folder), then reconnect. 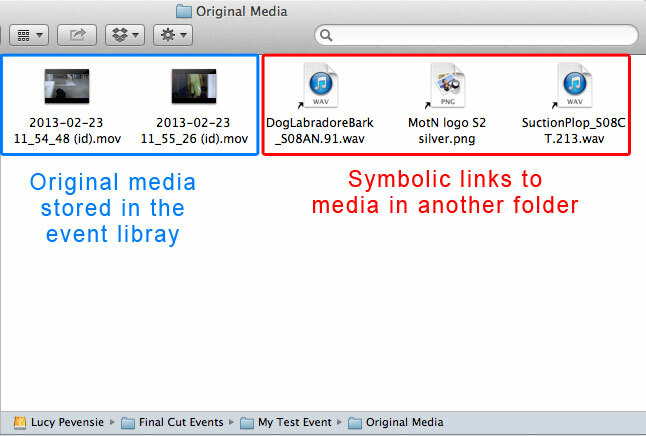 FCP X makes new symbolic links in the event folder, and you’re all set. The project should be reconnected. I’ve only found one problem with this so far. Compound clips don’t seem to translate when sharing projects, and FCP X unfortunately requires both the compound clip from the event and the source files that are inside it. This is problematic, as to make FCP X happy, you need to copy the compound clip over to the other person’s drive from inside FCP X. So, as far as I can see, the only way around this is to avoid using compound clips in shared projects. I recommend using the “Provide Final Cut Pro Feedback…” menu item to tell Apple you want this fixed if it bugs you like it does me. I’m certainly planning to send them a report. And there you have it! 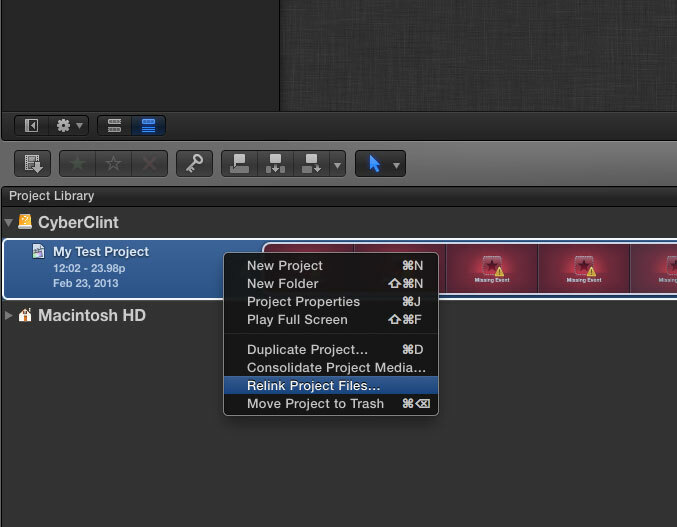 Once you know how, it’s simple to share a project between editors in FCP X. 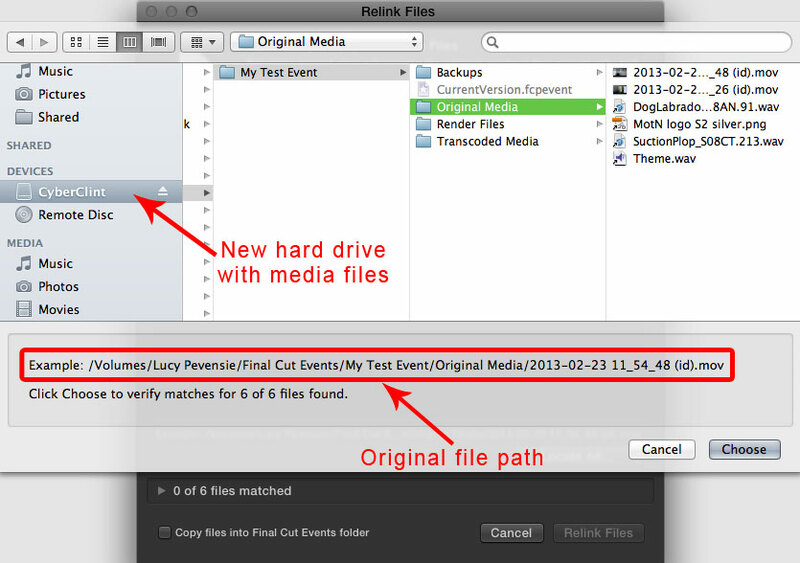 In some ways, it’s even simpler than FCP 7, because if you keep everything in the same event, you’ll be reconnecting media each time with just a few clicks, rather than searching over multiple locations for different sets of files. I hope you found this helpful. Leave a comment and let me know what you think. This entry was posted in Editing, Tips and Tricks and tagged Final Cut Pro X, tutorial. Bookmark the permalink. For the compound clip issue – when you duplicate a project and pick the Used Clips option, it’ll give you a choice to only duplicate multi-cam and compound clips. Couldn’t you make a compound clip only Event to share with the project when you need to send it? Still annoying, and I wish Apple would add another option between the current ability of compound clips and groups, but an idea that might let you share compound clips. Yes, that works. But in that case, FCP X puts all the source media, plus transcoded and (if you have it) proxy into that event’s folder. So you’re essentially going to have to share a really, really big folder with your co-editor. That’s not really an option for me, so I’ll just forego the extra organization for now and that’ll hopefully work. Have you ever experienced FCPX not recognizing a second external hard drive when you use 2 of the exact drives? I have this problem now. 2 Western Digital 2TB’s. I use one for editing and I want to use the second strictly for backup. When both are connected, FCPX only recognizes 1 at a time. I haven’t experienced that one, no. I do have two of the same drive with a similar idea of one for editing and the other for backup, but I use Time Machine to handle the backup (drive 2 is plugged into a Time Capsule), so I haven’t actually tried to launch FCP X with both drives mounted.